The Tell-Tale Heart was first published in 1843 in The Pioneer. It’s the story of a madman who murders an old man and then hides the body underneath the floorboards. 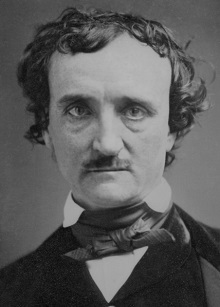 It is one of Poe’s most famous stories and a classic tale of terror and suspense. But even yet I refrained and kept still. I scarcely breathed. I held the lantern motionless. I tried how steadily I could maintain the ray upon the eye. Meantime the hellish tattoo of the heart increased. It grew quicker and quicker, and louder and louder every instant. The old man’s terror must have been extreme! It grew louder, I say, louder every moment! – do you mark me well I have told you that I am nervous: so I am. And now at the dead hour of the night, amid the dreadful silence of that old house, so strange a noise as this excited me to uncontrollable terror. Yet, for some minutes longer I refrained and stood still. But the beating grew louder, louder! I thought the heart must burst. And now a new anxiety seized me – the sound would be heard by a neighbour! The old man’s hour had come! With a loud yell, I threw open the lantern and leaped into the room. He shrieked once – once only. In an instant I dragged him to the floor, and pulled the heavy bed over him. I then smiled gaily, to find the deed so far done. But, for many minutes, the heart beat on with a muffled sound. This, however, did not vex me; it would not be heard through the wall. At length it ceased. The old man was dead. I removed the bed and examined the corpse. Yes, he was stone, stone dead. I placed my hand upon the heart and held it there many minutes. There was no pulsation. He was stone dead. His eye would trouble me no more.